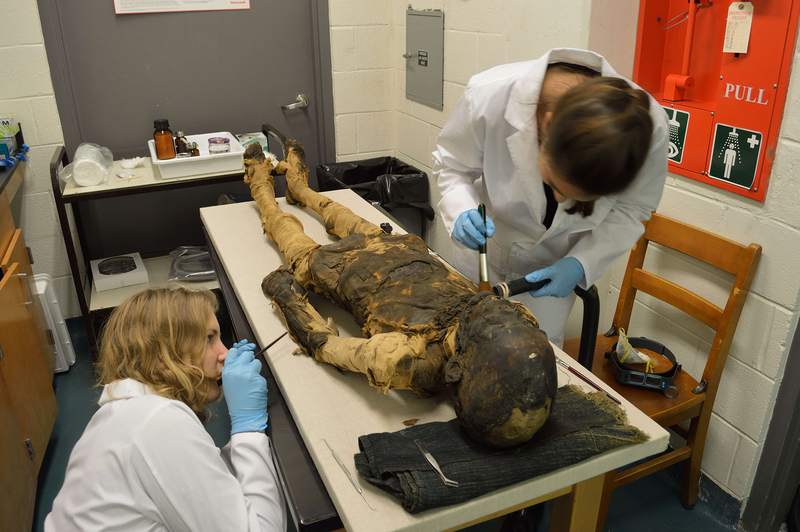 In spring 2013, Janelle Sadarananda (Classical Civilization, ‘13) and Miriam Hiebert (Chemistry, ‘14) worked alongside professional conservator Chris Wilkins (Central Virginia Archaeological Conservation) to consolidate and preserve the remains of Ti Ameny Net and her coffin. 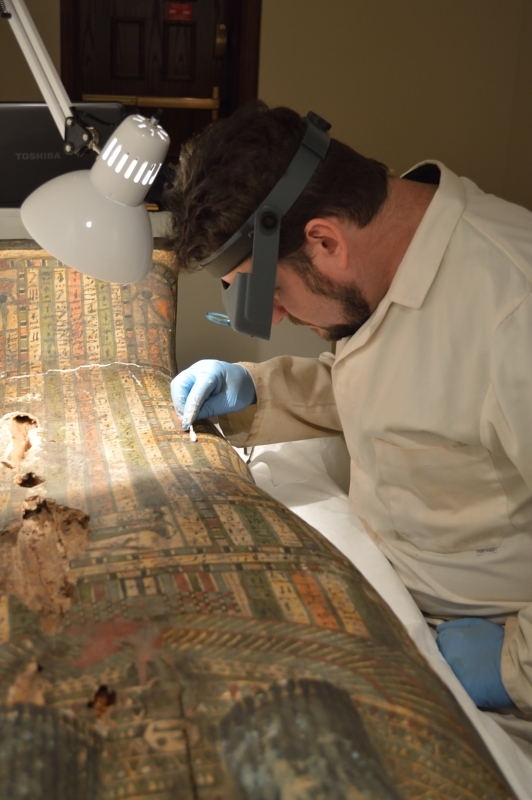 Time, transportation, and a lifetime of dust and wear received during her time at the University of Richmond had resulted in a number of structural concerns which the conservation process set out to address. Each of these identified issues was addressed individually, and material and chemical options for each task were identified and tested prior to implementation. The first issue addressed was that of the unidentified white deposit on Ti Ameny Net’s skin. While the deposit was clearly not organic in nature, its exact identity was unknown. After testing it was determined that ethanol was the best option for removal. Cotton swabs were used for this purpose and each ethanol soaked swab was discarded after one rotation on surface of the skin. Samples of the crystalline substance were saved for chemical analysis. Cleaning of dust and debris off the surface of Ti Ameny Net was done using a vacuum with a hose attachment that had been covered in cheesecloth. A soft brush was used to push dirt and debris off the surface and toward the hose. All collected material was stored for future analysis. The most time-consuming task was the re-attachment of linen wrappings to Ti Ameny Net’s neck, torso, and limbs. The procedure used was obtained from the conservation literature with a few alterations made at key areas that presented unique difficulty, on a case-by-case basis. The adhesive used for this procedure was a 5% solution of methyl-cellulose, chosen both for its long term stability and more importantly its solubility in water which allows for easy reversal of the process if the need should arise. The methyl-cellulose mixture was painted onto the surface of pieces of Japanese tissue paper and allowed to dry. Once completely dry, a piece of the tissue was cut to the size and shape of the loose bandage that it was being used to adhere. A humidifier was then used to re-activate the methyl-cellulose in between the bandages, taking care to avoid any excess moisture in the process. The layers were held together using weights or strips of silk, depending on the orientation of the site, and allowed to dry over night. Some sites required multiple rounds of this procedure to fully re-adhere to their correct location on the body. This process took nearly two weeks to fully complete. cleaning the surface of dust and dirt build up. re-attaching loose fragments of paint and linen to the surface. concealing the work that had been done during stabilization. 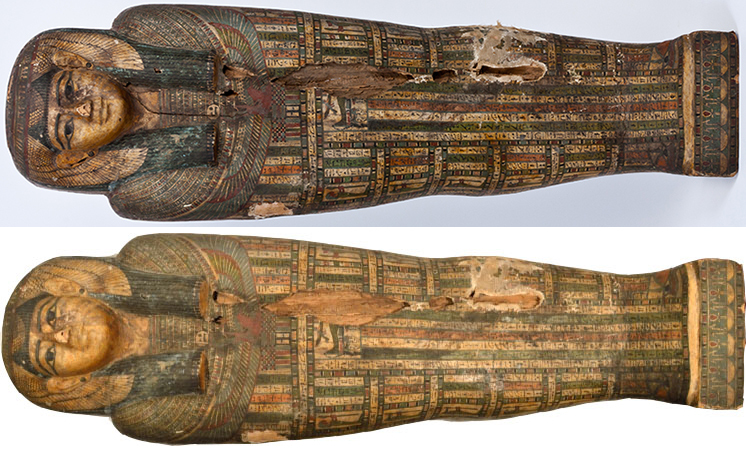 Cleaning of the coffin’s surface was done in a similar manner as had been done on the mummy. Ethanol swabs were used to remove grime build up, while care was taken to ensure that the varnish layer over the paint remained unharmed. Vacuuming was also used to remove larger, loose debris. Similarly, the reattachment of loose linen was done following the same procedure that was used previously on the mummy. The surface of the coffin was badly cracked. Some cracks affected only the gesso layer while others went deeper into the supporting wooden structure. While some cracks presented a bigger risk than others, all left the coffin structure vulnerable to insect attack or and changes in humidity. A paste made of glass microballoons mixed with an adhesive was injected into the cracks to seal and stabilize them. The filled-in cracks were then painted over with acrylic paint to match the field that they intersected. Samples collected during the conservation process were analyzed by a variety of scientific methods in 2013-2014, by Mimi Hiebert (’13) and Megan Hoerrner (’14) in the Gottwald Science Center on campus and at the Smithsonian Institution in Washington, D.C. For a summary of the tests and results, their poster for the Arts and Sciences Undergraduate Research Symposium is included here.